imma badass. 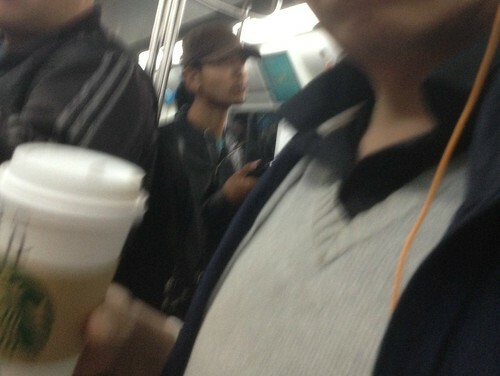 I drink in the subway train. Well, actually to be frank, eating and drinking aren't banned the subway system here. Well, either that or nobody is enforcing the rule. Eating and drinking is fairly common in the trains here in the Capital. As terrible as that may sound, I hardly see any litter, crumbs or spillage on the ground inside the train. With the kind of passenger traffic here, kudos to the subway system staff for keeping the trains and station very clean. Kudos also to the city's people for playing their part too. So it got me thinking about our own ban back in Singapore as well as the MTR system in Hong Kong. Is banning of food and drinks over-zealous? Recently the tension between Hong Kong residents and the overwhelming influx of QQland tourists boiled over and an argument broke out between the two parties. As you would have guess the trigger was over the incident of eating in the train. With the combo of smart phones and mobile internet, it was all over cyberspace instantly. I agree that the ban of food is essential to the hygiene and cleanliness of the trains. Heaven forbids someone tabao prata and curry and start eating in the train! However, I am thinking a meeting at halfway point perhaps? Perhaps drinks that has a lid on it would be permitted? Are you able to draw a comparison between the animosity felt between HKers and QQLanders and the current feelings we have back home towards FTs? I find that there is a similarity, albeit ours is more gahmen policy-centric, whereas for them, its more like disdain for guests who habitually behave poorly. Arrenn: It is more serious here in HKG as the number of people crossing the border is vastly larger. After all, for them it is just a skip and a hop to HKG compared to taking the plane to come into SG. Over in SG, it is said that they are taking our jobs but let's qualify the statement to say that they are taking the jobs that our own people "do not want". A big hoo-hah broke out when the HK gahmen bans pregnant QQlanders from coming to HK to give birth. The main reason was that the number of them coming in was so large that local HK mothers-to-be (MTB) end up having to compete for hospital care with them. Worse is that these QQland MTB are often quite wealthy than the average HK folks and hence the latter often end up at the losing end. This is just one of the many issues causing tension at the border. However, as much grousing as the HK folks are making, they make with gritted teeth, for their economy need these cross-border sources of income to sustain healthily. The youtube you saw was just a rare outburst. Arrenn: HK folks are generally a civilised bunch. We do get the occasional flare up here and there but if you notice, including our own STOMP, those people making the most ruckus are often the elder uncles and aunties. However, it is not to say that the mainland tourists are without fault. They can make quite an ugly scene to. Still, without singling out any one particular nationality, I am sure the ugly tourist existing everywhere. Did we not have the Ugly Singaporean in the past that prompted the gahmen to come up with a Gracious Singaporean campaign? So long never comment! But I am reading your each post faithfully! Me just back from Japan. The Japanese are allowed to eat on their subway. I am amaze the trains and stations are very very clean. I suppose the issue isn't with the food and drink but more so with the people who bring them onboard to consume it. I remember how chewing gum was banned in Singapore simply because people don't know how to dispose of them properly after eating. So the gahmen's draconian train of thought was that if you don't know how to dispose your gum properly, then perhaps you shouldn't eat it in the first place. That is not to say that the folks here in QQland are more civilised than Singaporeans. There are always bad and good apples in every barrel.